Chicken is such a bland meat that it is ideal for allowing additional ingredients to sing in the casserole or skillet. This approach is mirrored in the many and varied approaches taken to cooking with the bird from region to region in Italy. Depending on the compass point, it may be that Piedmontese mushrooms play a major role, or one or two of the fabulous lemons to be found in Campania, even some Marsala wine from the island of Sicily. If the recipe does not call for the whole bird, then breasts, legs, livers, or wings can be bought ready prepared from the butcher. Those who have the skill could cut down on the domestic budget by jointing a bird themselves and reserving the remaining body parts for other meals, not forgetting that the carcass can be boiled up with some root vegetables to make a stock for a risotto or sauce. Many regions have a version of alla cacciatora, or in the style of the hunter. 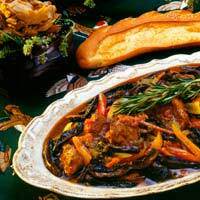 This can involve the addition of peppers or mushrooms together with a good white or red wine. As with all Italian recipes, the seasons play a crucial role so an earthier more autumnal approach may be substituted for a lighter touch during the summer months. Cacciatora calls for a heavy casserole pan. A soffritto of onions, carrots and leeks are sweated down, then the floured chicken pieces are coloured, garlic added and the wine poured over. After the alcohol has been allowed to burn off, the additional vegetables and a good stock are added along with whichever herbs of choice. Rosemary is synonymous with chicken but sage also works particularly well with mushrooms. The cacciatora is then allowed to simmer on the stove for one to two hours until the evaporation of the water and the flour combine to thicken up the sauce. Stuffing a whole chicken with a couple of lemons and a sprig of rosemary makes for an ideal dish for an early summer evening. When the bird has finished cooking in the oven, remove it to rest. Then deglaze the roasting tin with some good white wine, add a thinly sliced garlic clove and some lemon zest to make an aromatic sauce to spoon over the carved meat. Another tasty idea for treating a chicken destined for the oven is to rub pesto sauce over the bird prior to it going in to the heat. The oil in the paste will keep the meat moist and infuse both the finished bird and the entire kitchen with the wonderful aroma of basil. A medley of red wine, sage and chicken livers combined with a basic risotto recipe provides a wonderful autumnal rice dish. Halfway through the process of cooking the risotto, sauté the livers in some butter and add to the rice. Timing is important because adding the livers too early will result in overcooking them and compromising their delicate texture. The risotto can be finished off in the usual manner, with some grated parmigiano reggiano, a spoonful of mascarpone cheese or some extra knobs of butter and perhaps a garnish of flat-leaf parsley.